We started official home school with Brother this last fall and it’s been such a joy. He’s enrolled in kindergarten for an online public school in our state and it couldn’t be more suited to our needs. They offer a variety of excellent curricula for each subject, so we have plenty of options but not everything under the sun that would completely overwhelm me. We decided to sign up for every subject, so each week we do literature, reading, writing, vocabulary, math, science, social studies, fine arts, Mandarin Chinese and PE with him. The school ships all the curricula to us and we feel like kids in a candy store opening package after package of workbooks, textbooks, teachers guides, CD’s, DVD’s, art kits, science kits, math manipulative kits, etc., etc., etc. Every week we call to check-in with a teacher and if something isn’t working for us or he finishes something, she orders us more and voila! Another package on the porch! 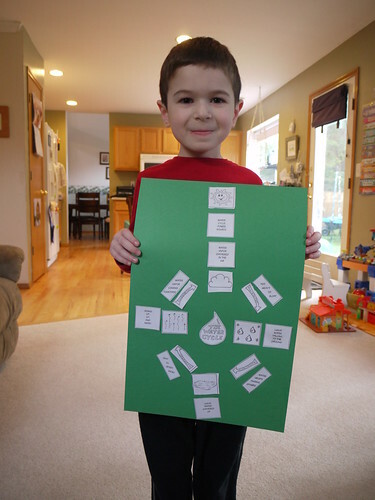 Here you see Brother displaying the Water Cycle diagram he made last week as a conclusion to our most recent science unit on exploring the water cycle. He says science lessons are his favorite because he enjoys making things like a wind meter, weather vane and water-cycle-in-a-bowl. 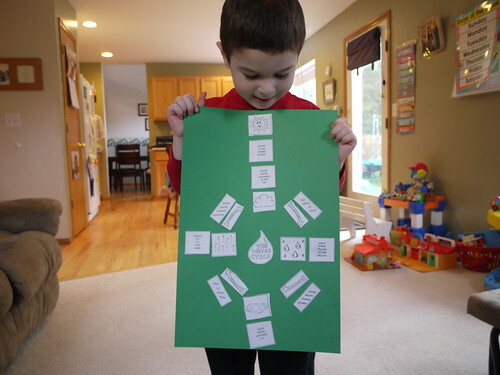 Math and art are at the top of his list, too, which are also very hands-on. It’s been a special treat to be able to educate our son like this in our home. He is an eager, diligent student who learns instantly and cheerfully. We couldn’t be happier with how it’s going and how much Brother loves it. What a blessing. Thank you, dear state! That sounds amazing! Do you mind if I ask how much it costs? Do you return the materials after you are finished with them? Wow, it’s great that Brother enjoys school so much and you get all of those materials free. I’m impressed with your patience in being able to teach your children at home. Thank you, Christy! Please let me know if you have any other questions after my other post. Thank you, Mom! I wish I were more patient and I think I’m getting better at it.